These were made popular by things like frequent flier programs, which rewarded business travelers for always returning to a particular airline. Obviously these programs are for more extensive today, ranging from free coffee or oil changes to rebates on HDTVs. It makes sense, then, that department stores will use their in-house cards to provide incentives for their loyal customers. This might be exclusive discounts or sales that only apply if you use your card when you make a purchase in the store. Rewards programs are very similar to loyalty programs, but in a much broader scale. Some rewards incentives are designed to offer more percentage points on specific items like gas or groceries. Others operate on a rotating catalog of products like restaurants and movies. Most of the time, you can get cash back rebates through these programs, but there are other incentives too. It is not always easy to find cards that don’t have an annual fee. This is one way that credit card companies make their money. Annual fees also help to pay for some of the operating expenses that go into maintaining your account. These cards are great to keep around for emergencies because they never cost you anything so long as you do not carry a balance. If you have one of these no annual fee cards just to use for this purpose, then your goal should be to pay it off as soon as you can. If you find a card with a low interest rate, you need to be careful that you understand what that rate actually applies to. Most cards carry different rates for the three types of balances that your card could carry: one rate for standard purchases, one rate for balance transfers, and one rate for cash advances. A low rate for standard purchases is almost alone in its range, so if you have a card like it would be wise for you to be careful how you use it. If you use it properly, though, you will surely be pleased. Just as low interest rate cards are typically designed to offer the rate solely on standard purchases, balance transfer cards usually offer an exclusively low rate on balance transfers only. This rate is also usually variable, which means it changes after a period of 3, 6, 9, or 12 months. While this may not sound like a good deal, you can take advantage of this offer by consolidating your other cards and saving money every month because you will have fewer payments. You can then take this savings and apply it to the balance that you owe so you can reduce your total credit all together. If you plot out the budget appropriately, you can pay off the entire balance before the interest rate changes to one that is much higher. If your credit is a little on the questionable side, you might be having trouble acquiring a credit card. As a credit risk, banks don’t want to take responsibility for any mistakes or slip ups you might have. Even if that was in your past and you are much better at making your payments now, it doesn’t matter because your mistakes are reflected in your credit score. Secured credit cards give you an option that is a bit of a compromise. Basically, you can put a deposit down on a credit card, similar to that of an apartment. When you are approved for one of these cards, you must give the bank your security deposit before they will release your card’s benefits. This security deposit does not have to be equal to the credit limit of the card, but is often lower. If you ever decide to close this account, you get the security deposit back. These are actually not credit cards. They work more like the card that is attached to your checking account. Basically, you can only use the card to pay for things that your checking account can compensate for. You use this card in place of checks but in the same way that you use a credit. This provides convenience for you, but also peace of mind knowing that you cannot over draft. 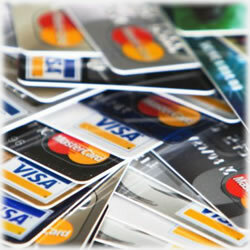 These pre-paid debit cards typically do not have a fee nor do they offer many fringe benefits. Still, they are a good alternative to carrying cash and are good for tracking expenses.